153 Beacon is located on the south side of Beacon, between Berkeley and Clarendon, with 151 Beacon to the east and 155 Beacon to the west. 153 Beacon was built ca. 1861, one of six contiguous houses (149-151-153-155-157-159 Beacon) built at the same time in a symmetrical pattern. The two houses on each end (149-151 Beacon and 157-159 Beacon) feature arched, extended entries and dormers with peaked roofs, and the two houses in the center (153-155 Beacon) have entries flush with the façade and originally had dormers with arched roofs (the dormer on 153 Beacon was remodeled sometime after 1942 to have a peaked roof matching the dormer on 151 Beacon). Click here for an index to the deeds for 153 Beacon. 153 Beacon was purchased on July 5, 1860, by a trust created by Charles Jackson for the benefit of his daughter, Lucy Cabot (Jackson) Morse, the wife of cotton manufacturer John Torrey Morse. The Morses made it their home; they previously had lived at 9 Hamilton Place. The Morses’ three adult sons – John Torrey Morse, Jr., Charles Jackson Morse, and Eben Rollins Morse – lived with them. John T. Morse, Jr., married in June of 1865 to Fanny Pope Hovey; after their marriage, they lived at 129 Charles and then, by 1869, at 100 Beacon with her parents, George Otis Hovey and Mary Ann Leveley (Cotton) Hovey. John Torrey Morse, Jr., was an attorney and later would become an historian and biographer. E. Rollins Morse, a banker and stockbroker in partnership with his brother, Charles, married in May of 1873 to Marion Ronaldson Steedman. After their marriage, they lived at 241 Beacon. Charles Jackson Morse withdrew from his partnership with E. Rollins Morse in about 1889. He continued to live with his parents at 153 Beacon. Lucy Morse died in December of 1892. Charles Morse moved soon thereafter. 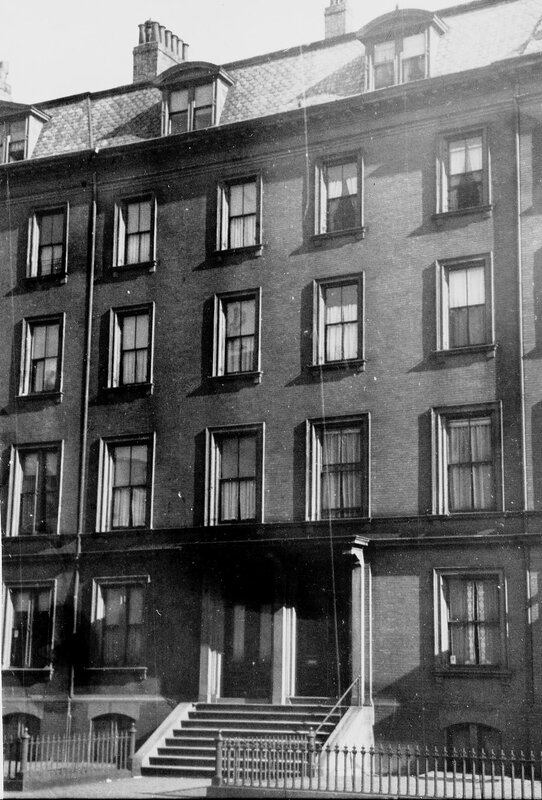 John Morse continued to live at 153 Beacon until his death in September of 1906. 153 Beacon was not listed in the 1907 Blue Book. On January 20, 1907, it was purchased from Lucy Morse’s trust and her estate by architect Richard Clipston Sturgis. He and his wife Esther Mary (Ogden) Sturgis, made it their home. From about 1917, R. Clipston Sturgis’s nephew, Alanson Hall Sturgis, lived with them. He previously had lived with his parents, William Codman Sturgis and Carolyn (Hall) Sturgis, at 61 Mt. Vernon and, before that, at 155 Beacon. Alanson Sturgis was a draftsman in R. Clipston Sturgis’s offices and when his parents moved to New York City, he came to live at 153 Beacon. He married in June of 1918 to Mary Wharton. After their marriage, they continued to live at 153 Beacon with R. Clipston and Esther Sturgis, who also maintained a home in Portsmouth, New Hampshire. Both families continued to live at 153 Beacon during the 1925-1926 winter season, but moved thereafter. By the 1927-1928 season, they both were living in apartments at 261 Beacon. R. Clipston Sturgis continued to own 153 Beacon and lease it to others. By the 1926-1927 winter season, 153 Beacon was the home of Lucy Sturgis (Codman) Borland, the widow of stockbroker William Gibson Borland, and their daughter, Rosamond. They also maintained a home in Beverly Farms. Lucy and Rosamond Borland continued to live at 153 Beacon until about 1931. Rosamond Borland was a decorator. The Chairman’s answer is not known, but apparently R. Clipston Sturgis decided not to resume living there and, instead, to sell the property. On August 1, 1932, 153 Beacon was acquired by Mabel W. (Robertson) Gleason, the wife of Walter Howard Gleason. They lived at 183 Beacon until about 1933 and at 188 Beacon from 1934. Walter Gleason was an attorney, real estate dealer, and investment broker. 153 Beacon was not listed in the 1932 and 1933 Blue Books, and was shown as vacant in the 1932 and 1933 City Directories. By 1934, 153 Beacon was the home of Miss Gladys F. Churchill, a secretary, who probably managed the lodging house for the Gleasons. The previous year, she had lived in an apartment at 231 Beacon. She continued to live at 153 Beacon until about 1942. On May 29, 1947, 153 Beacon was acquired from Mabel Gleason by Dr. Arthur Joseph Driscoll, Jr., a physician and orthopedic surgeon, who continued to operate it as a lodging house. He lived at 153 Beacon with his parents, Arthur Joseph Driscoll, an egress inspector for the Boston Building Department, and Edith Louise (Robertson) Driscoll. 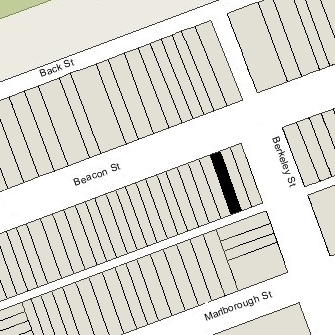 They previously had lived in an apartment at 124 Marlborough. In May of 1952, Arthur Driscoll applied for (and subsequently received) permission to remodel the building and convert it into eleven apartments. Arthur Driscoll, Jr., married in the early 1950s to Lucy Peckham. In about 1954, they moved to Bristol, Connecticut, and on February 11, 1955, he transferred 153 Beacon to his parents. 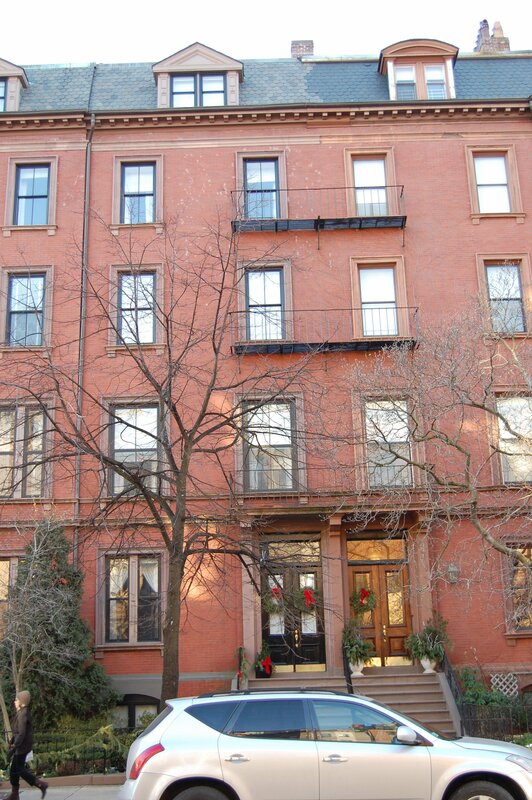 Arthur and Edith Louise Driscoll continued to live in an apartment at 153 Beacon. She died in 1958, and in he remarried soon thereafter to Doris Buchanan. After their marriage, they lived at 153 Beacon until the early 1960s, when they moved to Needham. On November 1, 1960, 153 Beacon was acquired from Arthur J. Driscoll by Wainwright J. Wainwright. On March 31, 1961, 153 Beacon was acquired from Wainwright J. Wainwright by real estate dealer and property manager Robert White. In May of 1961, he also acquired 151 Beacon, also an apartment house with eleven units.